It may be a sign that something must change when I have dreams that I'm at work. I don't have a particularly difficult job, you see. Though it does have its dirtier aspects, such as getting splattered with whipped cream, the occasional burn and/or scald, not to mention Customer Aggro, I would have to say overall it is a good job! As long as the girls don't have PMS at the same time, I can swing it. Did I mention that I luuuuuvs me fresh coffee? In this particular dream of mine, (or is it nightmare?) I was making a metric ton of Milkshakes. And yes, my milkshakes do bring the boys to the yard... at least in my dreams. I had just gotten all the milkshakes into their respective cups, and next I had to garnish them with whipped cream. 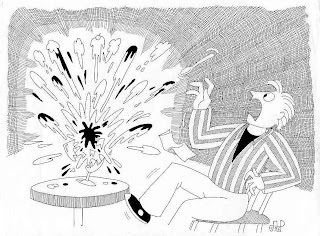 We have this one particular whipped cream canister at work with a hair trigger, and in my dream, it exploded all over the counter and myself. It got everything but what it was supposed to!...ah well, such is my chocolate-covered life. At least I don't have a high-pressure job where the balance of life and death is magically contained in my whipping cream.